UNDP’s presence in Bonn will focus on how our diverse portfolio of projects – covering everything from adaptation to clean energy to climate finance to disaster risk – is supporting countries to achieve their ambitious goals and targets. A full-slate of side events covering these important topics will be held at the UNDP Pavilion and will emphasize UNDP’s approach to NDC-implementation: PLAN, ACCESS, and DELIVER. UNDP will host a number of side events on climate change adaptation at the United Nations Climate Change Conference (COP23). At the conference nations of the world will meet to advance the aims and ambitions of the Paris Agreement and achieve progress on its implementation guidelines. Keeping abreast of the newest developments in climate change is essential to make timely, effective and sustainable decisions. Yet, adequate time and space for learning are rarely accessible for busy delegates, decision-makers and full-time working professional. This is why UNCC:Learn developed the Climate Classroom - a mobile learning space that ‘pops up’ at the center of major climate change conferences and related events. 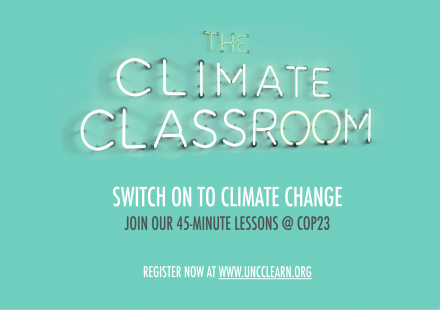 The Climate Classroom offers focused 45-min learning sessions on highly relevant climate change topics delivered by select experts in English and French. During each session, the lecturer and the 20 participants will be equipped with professional head-sets through which they will be able to follow the lecture and engage in discussion. A booklet is available to all participants at the beginning of each session, including a summary of the content and links to additional information. Participants completing the sessions will receive a UN CC:Learn pin and become part of the Alumni community. UNDP will present in the adaptation section. The session will define climate change adaptation (including related concepts: vulnerability to climate change, adaptive capacity, climate risk, resilience) and illustrate it with examples, explore why adaptation is important, and explain existing international frameworks and processes on adaptation/DRR (Nairobi Work Programme – NAPAs – NAPs – the Paris Agreement, the 2030 Agenda for Sustainable Development). Country representatives, UNDP, and other development agencies and international partners will present their current initiatives to support the crowding in of public and private investment for climate adaptation. This will include information on current and future Global Environment Facility and Green Climate Fund projects designed with the support of UNDP that feature significant private sector engagement (PSE). A panel discussion on PSE in adaptation will follow the presentation, touching more on UNDP’s work, and other international partners’ work and insights in this field. The discussion will also cover the increasing importance of private investment in meeting CCA challenges, and effective strategies for crowding-in private investment. 1. What kinds of private sector actors do we need to engage (e.g. MSMEs; value-chain/market actors; FI/investors, etc.)? What roles can the private sector play in providing climate financing and more broadly supporting adaptation? 2. 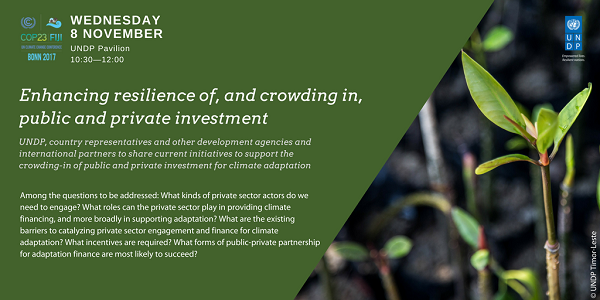 What are the existing barriers to catalyzing private sector engagement and finance for climate c adaptation? 3. What incentives are required to remove the barriers and catalyze greater private sector participation? 4. Mechanisms and modalities to engage PS (for e.g. MSMEs) and deliver climate financing through private sector? What forms of public-private partnership for adaptation finance are most likely to succeed? 5. Lessons learnt and best practices from the country perspective. Country representatives and UNDP will present experience in designing innovative solutions to climate change impacts and transformative adaptation projects that have been approved or presented to the Green Climate Fund, in the context of the Paris agreement adaptation goals. Lessons learned in accessing climate finance, through design/preparation of innovative and transformative projects, will be discussed together with a showcase of best practices from UNDP-GCF projects. - What can transformation and innovation mean in the context of GCF-UNDP adaptation building? - How to reconcile development and adaptation needs of countries (development vs. climate change incrementality/additional costs due to climate change)? - What are the modalities for financing adaptation projects and programmes (grant vs. non-grant instruments)? 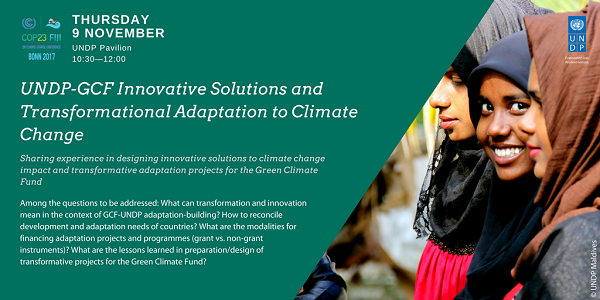 - What are the lessons learned in preparation/design of transformative projects for the Green Climate Fund? The objectives of this seminar are to support countries with information for further improving quality of proposals to the GCF to access funding for the formulation of NAPs and other adaptation planning processes. Participants will also learn to odentify and share good practices for high quality NAPs and other adaptation planning processes that catalyse adaptation action and investment, and strengthen awareness of and coordination among adaptation planning support providers. Climate change adaptation in agriculture is a foremost priority in developing countries. According to a FAO analysis of the Intended Nationally Determined Contributions (INDCs), 93% of developing countries included agriculture in their adaptation needs. The process of formulating and implementing National Adaptation Plans (NAPs) while addressing the agricultural sectors provides a tool for the implementation of the adaptation commitments under the Paris Agreement on Climate Change. The process to formulate and implement National Adaptation Plans was established under the Cancun Adaptation Framework as a mechanism to enhance medium- to long-term climate change adaptation planning and implementation in least developed and developing countries. Specifically, NAPs aim to reduce vulnerability to the impacts of climate change, by building adaptive capacity and resilience, and to facilitate the integration of climate change adaptation into relevant new and existing policies, programmes and activities, within all relevant sectors and at different levels, as appropriate. As the Sustainable Development Goal (SDG) 13 on Climate Actions connects the 2030 Agenda on Sustainable Development and the Paris Agreement on Climate change, NAPs provide a vehicle to deliver not only on the national adaptation priorities under the Paris Agreement but also on broader development commitments. Through the Integrating Agriculture in National Adaptation Plans programme (NAP-Ag), the United Nations Development Programme (UNDP) and the Food and Agriculture Organization of the United Nations (FAO) are working together with ministries of Agriculture, Environment, Planning and Finance, and key national stakeholders in Colombia, Guatemala, Kenya, Nepal, the Philippines, Thailand, The Gambia, Uganda, Uruguay, Viet Nam and Zambia to incorporate agricultural sectors into National Adaptation Plans processes. In doing so, the programme aims to safeguard livelihoods, raise agricultural production and boost food security. In all target countries, agricultural sectors, including forestry and fisheries, have been identified as the most vulnerable to the effects of climate change, but also key to ensuring food security and reducing poverty. The programme is funded by the German Federal Ministry for the Environment, Nature Conservation, Building and Nuclear Safety (BMUB). 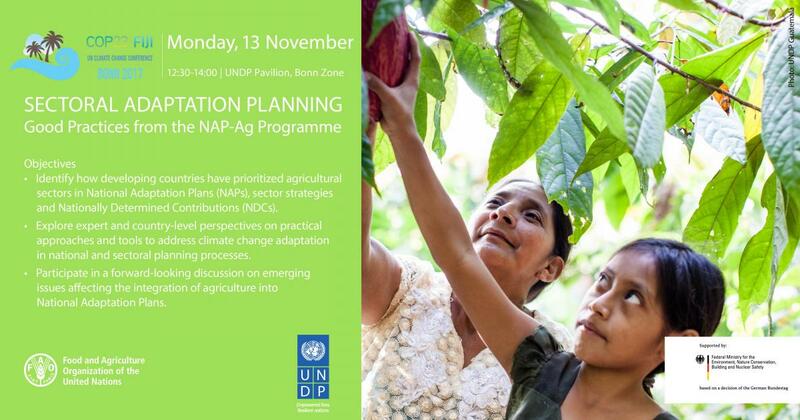 The side event will bring together NAP-Ag country representatives and experts in the field of climate change adaptation in agriculture to discuss ongoing activities in the formulation and implementation of NAPs and their contributions to the Paris Agreement and 2030 agenda through their NDC’s. 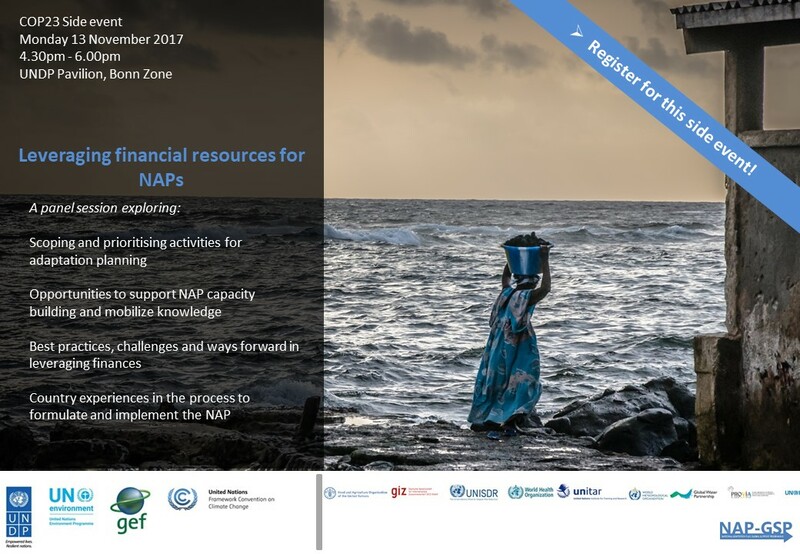 The side event will bring together NAP support agencies and donors, as well as country representatives, to present the steps countries take to lay the groundwork including scoping, sequencing, designing adaptation planning proposal and financial resource mapping for their NAP process. This baseline work is crucial and undertaking it is vital to attracting finance both for the adaptation planning projects at the design board but also for implementing NAPs. Support for this requires drawing financing from all available support sources. Many countries have started their NAP process and developed roadmaps but have lacked resources to go beyond these initial steps. The NAP-GSP, NAP-Ag and other support programmes by bilateral technical partners, have supported countries in establishing the baseline for adaptation planning, identifying the support needs, developing capacities to advance the NAP process and institutionalize adaptation mainstreaming. These activities constitute the foundational work for countries to leverage funds to formulate and implement their NAP. The side event with present the Climate Box Learning Toolkit developed by UNDP and piloted with educational systems in Russia, Kazakhstan (Nazarbaev Intellectual School Network), Kyrgyzstan and Tajikistan. Since 2017, Armenia, Moldova, Turkmenistan and Uzbekistan will be joining the Climate Box project. The Climate Box is already available in English, Russian, Kazakh, Kyrgyz and Tajik languages. On line version is available at www.climate-box.com and through the mobile applications. The Climate Box is a new source of information on climate change for schoolchildren and teachers helping them learn how to protect our planet. It provides a unique opportunity for international cooperation and exchanges among youth and educational institutions on climate action. It was featured at EXPO-2017 and generated a lot of interest. 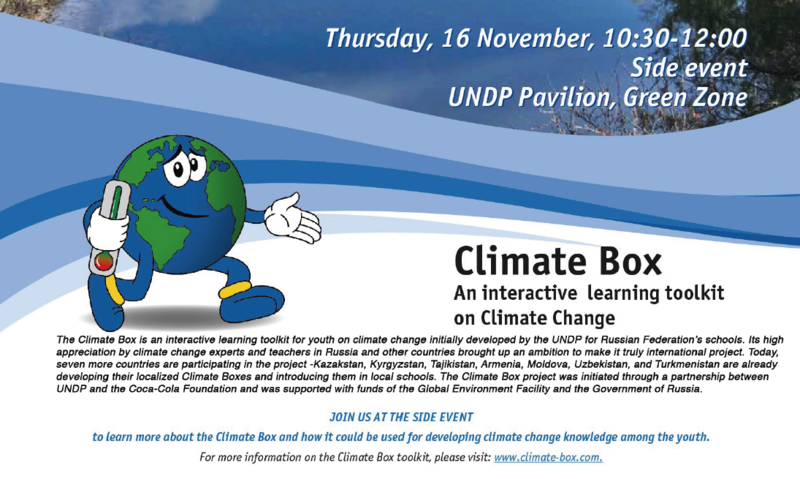 During the Side Event, the Climate Box will be presented by the authors and partners who will share experiences of engaging with school children on climate change. Opportunities and partnerships for further scaling up beyond the ECIS region will be explored. The Climate Box was initiated through a partnership between UNDP and the Coca-Cola Foundation and was supported with funds of the Global Environment Facility and the Government of Russia. Lao PDR and Timor-Leste are facing similar environmental challenges in different environments. 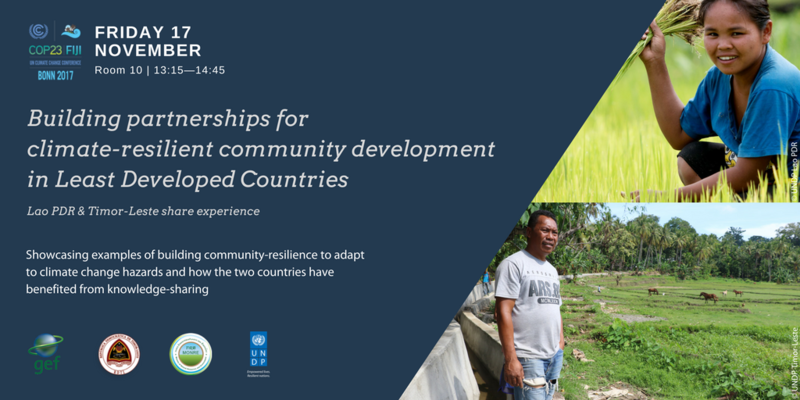 Communities in both countries are preparing for increasing risk from climate-driven events such as drought, landslides, floods and erosion. To tackle the issues, the two countries have been working together, exchanging ideas and experiences on increasing the resilience of essential small-scale rural infrastructure. A side event at COP23 in Bonn will showcase how the two countries have benefited from knowledge-sharing, and how a combination of engineering and ecosystems-based solutions can best support climate change adaptation. In October 2017, UNDP J-CCCP co-hosted the Youth Climate Change Conference with 600-plus participants from eight Caribbean countries and Japan. The programme seeks to advance and advocate for the increased roles and responsibilities of youth in climate change planning. The J-CCCP has partnered with several organizations to build on existing climate mitigation/adaptation actions. These partnerships work to strengthen activities and enhance coordination. The session will demonstrate the value of the collaboration with these partners contributing to the advancement of NAPS and NAMAs in some Caribbean countries. Learn more about climate change adaptation events supported by other agencies. The conference, officially referred as COP 23/ CMP 13/ CMA 1-2, will take place in Bonn, Germany, hosted by the secretariat of the UN Framework Convention on Climate Change (UNFCCC), and presided over by Fiji. 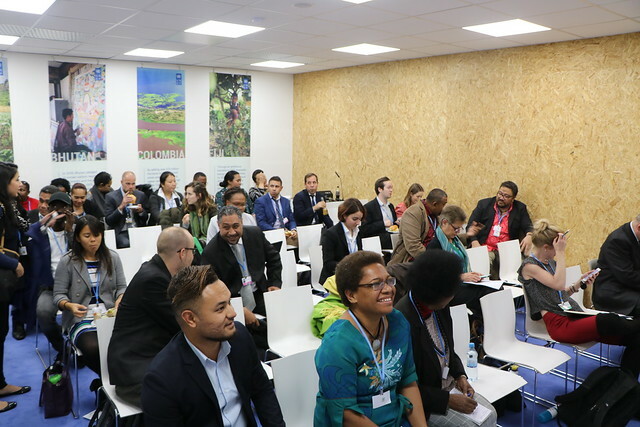 The UNFCCC secretariat and the Government of Fiji are closely working with the Government of Germany, the State of North Rhine-Westphalia and the City of Bonn to ensure a dynamic and successful Conference. On 27 July 2017, the UNFCCC Executive Secretary Patricia Espinosa briefed embassies in Berlin about COP23 underlining the importance of cooperation in the preparations for the conference. “Cooperation makes COP23 possible. It also raises awareness of the vulnerability of islands and all nations. And it opens the door to even more collaboration and support – for resilient communities and for the transition to growth powered by clean energy”, she said at the event. The presentation and remarks are available here. 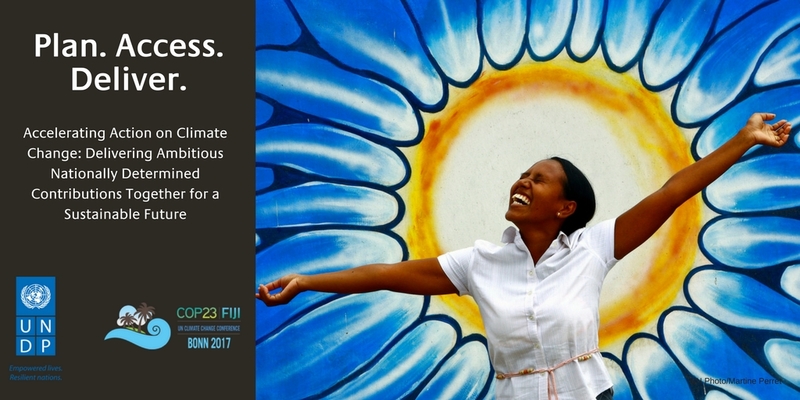 The COP23 is being organized following an innovative concept of “one conference, two zones”. During the two weeks of the conference, a vast area of the city of Bonn will become the Climate Campus that will be organized in two zones: the “Bula Zone” and the “Bonn Zone”. This approach focuses on a close integration of the zones to ensure that negotiations, events and exhibits are integrated into one conference. The Bula Zone, where talks between governments will take place, will be composed of the World Conference Center Bonn, UN Campus and an extended area behind the Deutsche Welle building in Bonn. The word Bula originates from the Fijian culture and means hello as well as a blessing of health and happiness. The Bula Zone will be open from Monday, 6 November until Friday, 17 November 2017, except Sunday, 12 November. Opening hours will be from 8 am to 11 pm. Offices for delegations will be accessible 24 hours, with reduced services on Sunday, 12 November, as well as during night times. The Bonn Zone, which will be located in Bonn’s Rheinaue Park area, will accommodate events showcasing climate action, including high-level events, side events and exhibits organized by both UNFCCC and the Government of Germany. It will also include some media activities as well as events in the delegation pavilions. The Bonn Zone will be open from Monday, 6 November until Friday, 17 November 2017, including Sunday, 12 November, from 8 am to 10 pm. Whether you will be in Bonn in November or following the conference virtually, this COP23 Conference Information Hub gives you a quick access point to find out how to participate or follow the negotiations and how to navigate through the many pieces of information and news that are available.